(l.-r.) Chris Crowley, OECTA; His Excellency, Bishop Gerard Bergie, Diocese of St. Catharines; OCSTA Director and Bruce-Grey CDSB Chair, Beverley Eckensweiler and MPP Bill Walker – Bruce-Grey-Owen Sound. 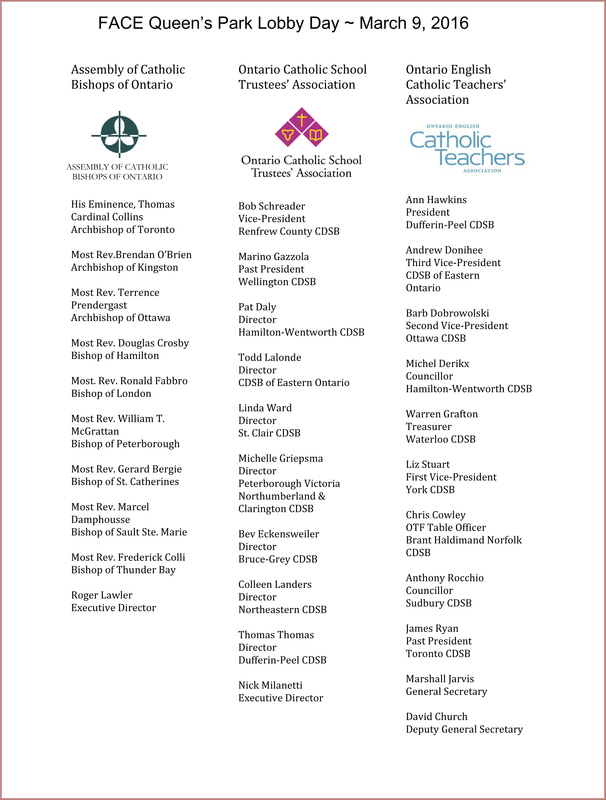 For the first time in recent memory, MPPs in the Ontario legislature gave a standing ovation for the representatives of Ontario’s publicly funded Catholic school system, many of whom were present in the Members Gallery on March 9th. 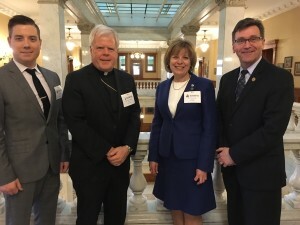 Representatives of FACE (Friends and Advocates for Catholic Education) – the joint initiative between OCSTA, OECTA and the Assembly of Catholic Bishops of Ontario (ACBO) – were seated in the Legislature for Question Period as part of FACE’s annual Queen’s Park Lobby Day for Catholic Education. Coordinated by FACE Project Manager Carole Allen and Enterprise Canada consultants, the day involved several meetings between MPPs and members of the FACE delegation team which included representatives from OCSTA, OECTA and ACBO. 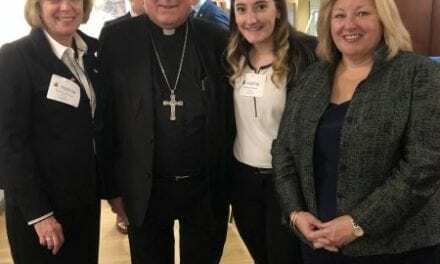 Each MPP meeting provided an opportunity for FACE delegation team members to discuss the contributions, made by the students and staff in Catholic schools, to the vitality and success of Ontario’s education system. 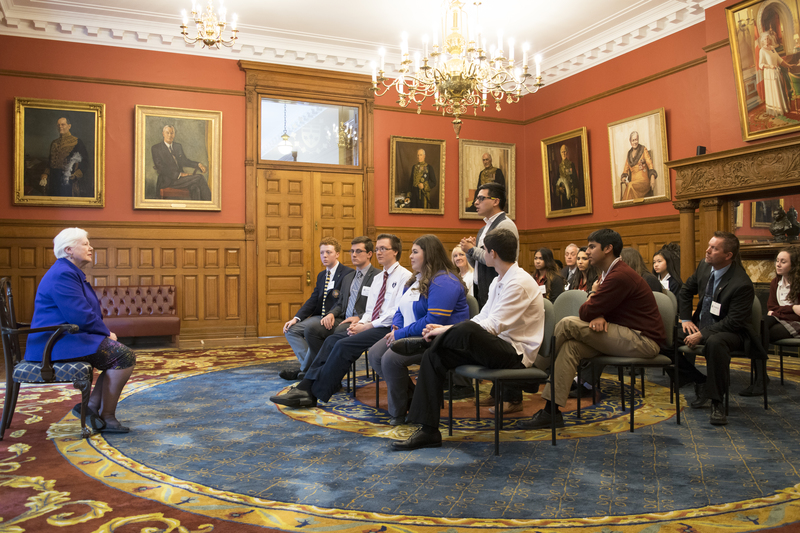 During the introductions portion of Question Period, many MPPs took the time to acknowledge and welcome representatives of Ontario’s publicly funded school system. 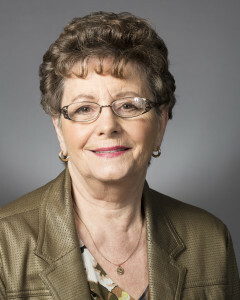 Mr. Grant Crack (MPP Glengarry-Prescott-Russell): I’d like to introduce members of the Friends and Advocates for Catholic Education who are present in the gallery this morning. 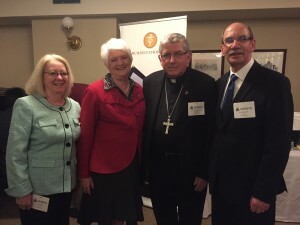 This group includes the Ontario bishops’ council, led by His Eminence Cardinal Collins; representatives of the Ontario English Catholic Teachers Association; and representatives of the Ontario Catholic School Trustees’ Association. They’ll be meeting with MPPs throughout the day and will be hosting a reception at 5 p.m. in the legislative dining room this afternoon. Welcome to Queen’s Park, everyone. 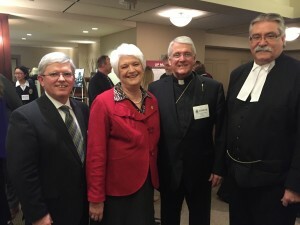 (l.-r.) OECTA President, Ann Hawkins, Minister of Education, Liz Sandals; His Eminence, Thomas Cardinal Collins, Archdiocese of Toronto and OCSTA Vice President, Bob Schreader. 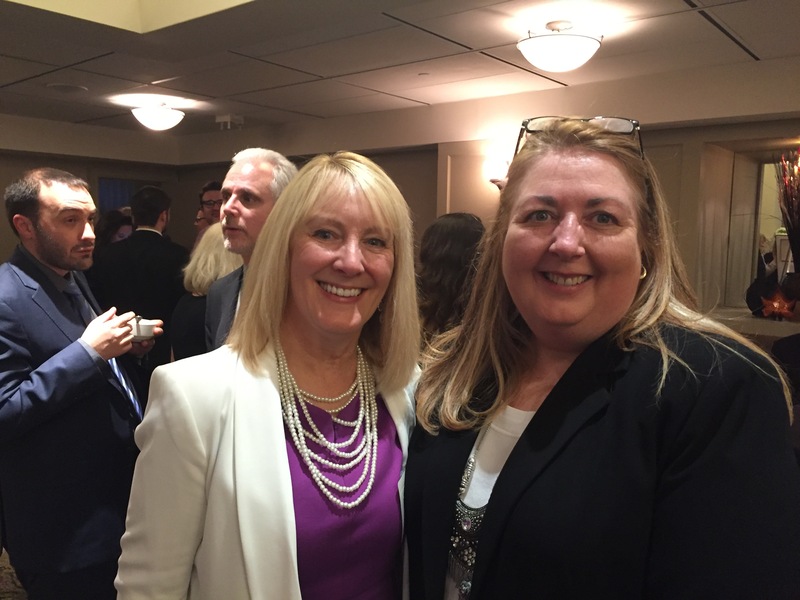 FACE Project Manager, Carole Allen (left) with OAPCE Vice President, Heather Pyke. 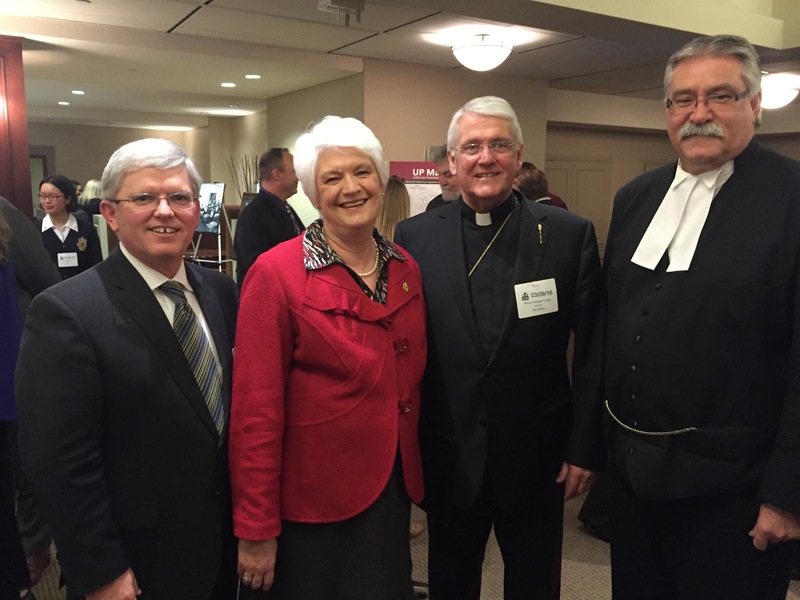 OCSTA Director and Chair of Hamilton-Wentworth CDSB, Patrick Daly, Minister Sandals, His Excellency, Bishop Douglas Crosby, Diocese of Hamilton; and The Hon. Dave Levac, Speaker of the House. Throughout the day there were 18 meetings with senior policy advisors to Ministers and the Premier, meetings with Ministers, MPPs from both government and each opposition party, as well as a meeting with the Leader of the Opposition. 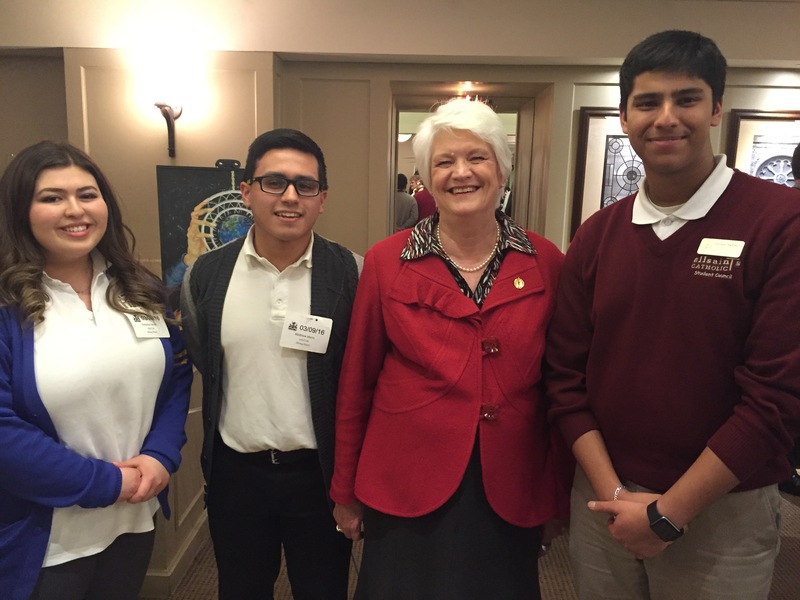 Several students from Catholic secondary schools across the region were invited to be a part of Lobby Day. In addition to tours of the legislature, students were invited to meet with the Lieutenant Governor of Ontario, the Honourable Elizabeth Dowdeswell, OC, OOnt. During the Lobby Day reception students and teachers participated in displays and performances that highlighted artistic and academic achievement at Ontario’s Catholic schools. 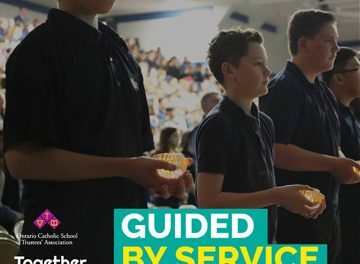 We’d like to thank students and staff from the Toronto CDSB, Durham CDSB, Dufferin-Peel CDSB, Niagara CDSB, Bruce-Grey CDSB and Brant Haldimand Norfolk CDSB. This week OCSTA Policy Advisor – Finance, Wally Easton, issued a memo to Association members that provided an overview of the 2016-17 Grants for Student Needs recently announced by the Ministry of Education. That memo can be viewed here. OCSTA’s 86th Annual General Meeting and Conference will take place April 28-30, 2016 at the Blue Mountain Resort, near Collingwood. 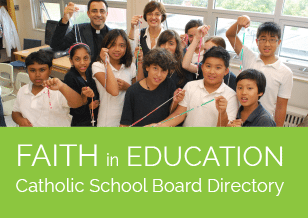 At this year’s AGM elections will take place for the positions of President, Vice-President and OCSTA Representative to CCSTA (the Canadian Catholic School Trustees’ Association). The deadline for receipt of nominations in the OCSTA office is 10 a.m. on Friday, April 8th, 2016. Use our online registration form to register now. 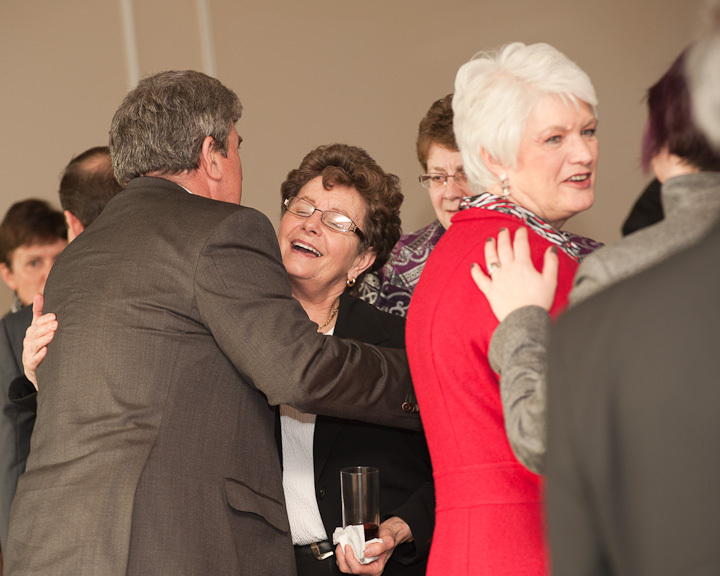 Prior to every AGM and Conference, OCSTA partners with the Ontario Catholic School Business Officials’ of Ontario to host an annual Business Seminar which this year will happen on Thursday, April 28, 11:30 a.m. (the Seminar includes a pre-session lunch) at the Blue Mountain Resort. Our keynote speaker this year will be Peter Norman, Vice President and Chief Economist with the Altus Group. Other sessions include a presentation by Reg Pearson, Associate Deputy Minister, Treasury Board Secretariat Bargaining and Compensation, and a panel discussion reviewing the new collective bargaining process. OCSTA is pleased to announce that Association Director and Trustee with the Northeastern CDSB, Colleen Landers, was appointed last December to the Ontario College of Teachers’ Council. The37-member Council governs the College and develops and approves policies that regulate the teaching profession in Ontario. 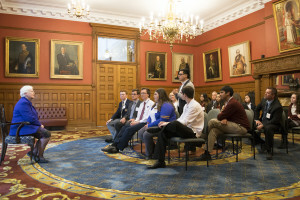 The Council is made up of 23 members of the College elected by their peers and 14 members of the public appointed by the provincial government. Keynote speaker: Michael Redfearn – author, digital literacy consultant and former secondary school teacher (21 years in education).